Raise your hand if you were a Sourcecon virgin, rookie, or noob last week in Dallas? Yeah… I see you. Me too. Everyone brings their own perspective, frame of reference, history… baggage as some call it, to these things and I’m no different. Full disclosure… I’m a recruiter. There I said it. I’ve spent over a decade running a full cycle on the agency side, first with a big firm and then on my own and another ten prior to that consulting with large companies. I’ve sourced, recruited, developed and implemented strategies, and closed more candidates and clients than I can remember…but there is always more to learn and I believe you get better by being open to change, new things and different ways. 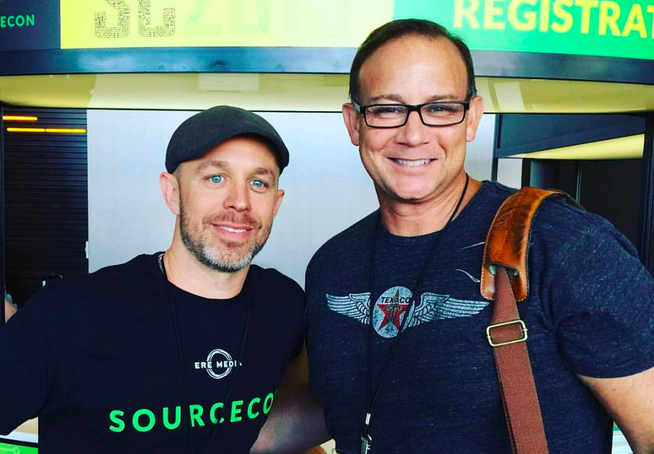 So when I told Sourcecon Editor In Chief, Jeremy Roberts, whom I’ve known for a long time, that I wanted to see what is happening at the forefront of sourcing, he said I had to come to Sourcecon. And I was not disappointed. It was a great and positive experience where I learned a lot, made great new friends and contacts, validated some of my thoughts about the direction of sourcing and recruiting, and was also surprised and had my eyes open about a few things too. If you’ve watched the new Stephen Cobert Late Night Show, you will notice his band is called “Stay Human.” If there was one theme throughout the entire two days at Sourcecon, it was … STAY HUMAN. Despite “shiny new thing” syndrome or the latest greatest way to search… at some point we all actually have to communicate and connect with a HUMAN. And almost every presentation or keynote I heard drilled that point home effectively. Even sessions that you would have thought were going to be all technology or automation, ended up reminding us that success comes by treating everyone like a real person, speaking like a real person, and acting like a real person. SOURCERS HAVE A SEAT AT THE TABLE NOW. For those of us dinosaurs in the field, you’ll remember that we used to call sourcers “researchers” and it was a function… not a role or a career path. It was on the bottom quarter of the totem pole. Of course, finding people has become infinitely more complex, but I was really surprised how the “role” and position of “sourcer” has has evolved into more of what a recruiter has traditionally done… especially in large corporate settings. The traditional recruiter role (at least in many of the large companies I spoke to at Sourcecon) seems to be morphing into a pseudo administrstrative role that has greater focus on shepherding the candidate through the process, compliance, all around BS and red tape, etc. or managing the handoff to the hiring manager. I was surprised to find out how in some organizations the recruiter role is becoming more of an account manager or go-between than actual recruiter or closer. It is the sourcers, being the first point of contact, who have the greater candidate interaction and trust; and are taking the candidate far into the process. Jeez. They are doing the cool stuff recruiters used to do and have greater influence than ever before. more seasoned and skilled recruiters making the move to a sourcing role…Click To Tweet something you never would have thought or seen before. The “value” and voice of the role has been elevated. Metrics Rule… But Which Ones? Metrics are an integral part of any successful recruiting or sourcing effort, but in roundtable discussions, I was surprised at how high the req load and volume is for recruiters, in comparison to how low the expected volume or production from sourcers seemed to be. There were more than a few, “whew” or “thank God I’m just happy if I get one or two candidates from my sourcers (I realize that when recruiting tech unicorns that’s understandable). However, fewer people than I expected seemed to have a finite handle on the ratios necessary to create a successful funnel. I also found it interesting the variety of metrics sourcers were held accountable for. One of the best discussions I heard was from Balazs Paroczay @Thebalazs who in my opinion is ON POINT with metrics for sourcers by measuring what they can control and are responsible for in the process! Smart guy who gets it! I’m following him for sure. There were companies there who have elaborate and fully developed sourcing roles and systems in place, others in attendance were just starting and looking for best practices or considering establishing a separate sourcing function. What I realized was while there are major companies or forward thinking organizations that have the resources and initiative to treat sourcing as a skill and role; the majority are still wrestling with it in the weeds or unable to make the leap and will limp along as as result. That leaves great opportunity for sourcers with talent and vision. It became obvious to me there remains wide gaps and opportunities to serve small to midsize companies or larger companies who won’t, can’t, or haven’t realized the challenges a separate sourcing function can solve. Good sourcers (especially in light of how their role has expanded and morphed into a more recruiting oriented role) will have great value, opportunity, and career mobility moving forward as smart ones realize that they can take those talents many places. If you ask two chefs to make you an omelet, you know that you are going to get breakfast, but how they prepare the omelet or arrive at the finished product can vary wildly. I was in complete awe of some of the advanced searching and technical abilities and creative use of the web, extensions, apps, and tech to find someone. Everyone likes shiny things… and there are a lot of them to choose from. And while the State of Sourcing Survey ranked the phone a distant 5th behind the great and powerful LinkedIn as an important tool for sourcers, I was very happy to hear people like @SourcingShannon and others share the the message that regardless of how you get the name, the phone is still the most “potent” weapon we have. CLEVER, CREATIVE, A LITTLE ON THE EDGE… AND I LIKE IT. Many of the sourcers and people I met seemed much riskier, assertive, and creative in how they reached people than you might initially think… and I’m not talking about search strings. I enjoyed and was blown away by Glen Gutmacher’s clever suggestions for using other connections, ties, and relationships (including spouses) to back into finding someone. The best recruiters and sales people I know, (because, after all, we are selling someone to leave their current situation and come to us) all have that creative, non-spammy but “anything goes” mentality. I loved seeing it in the sourcing world. THERE IS NO RIGHT OR WRONG… except don’t “spam”, that’s just wrong. Sourcing is fluid. Going back to my breakfast analogy from earlier, there are a lot of ways to make the omelet… and sometimes you want pancakes instead. Y’ALL ARE SO NICE AND GENEROUS. IT WAS AN AWESOME, COLLABORATIVE, DIVA-FREE ZONE. This is not an ingratiating thing, but I was honestly impressive at how friendly and giving everyone was. I was the new kid in town (I’ve been listening to a lot of The Eagles lately) and it was a welcoming friendly group. Why is that surprising? Think about it. When you go to these things, you know who the rock stars are. The ones everyone wants to meet, has read, or follows. The keynoters, presenters, etc. Sometimes, this is a nightmare because they believe their own PR or act as though they are leaving pearls of wisdom with every breath and are doing you and the unwashed masses a favor by speaking to you or meeting after a presentation or in the hall. OMG… (Yeah I just dropped an OMG like a High School kid, so what? )… YOU ALL ARE SO NICE. Every single one of those sourcing “rock stars” were awesome, down to earth, nice, and so incredibly open with information both on and off the stage. A perfect example of this is when I stopped Jim Stroud to speak with him after his presentation. After a few moments he says, “Hey, you work with CEO & CFO’s right?” Why yes I do. He then said, “Here is an idea. Why don’t you try this…” and like the Gap Band dropped a bomb on me that was so awesome and impressive that I’m using it immediately. I’ll write about it later but you all will love it. Jim didn’t know me from a bar of soap and yet listed, and offered this fantastic well thought out UNSOLICITED advice. Thank you sir. And that was but one example. This is a random bi-product of SourCon, but goes to show that you never know the impact we have on someone’s career. I’m in a session when I get a Tweet from David Manaster, Founder of ERE, who asked, “Are you this Bradley Richardson?” He then sent a picture of the cover of my first book JobSmarts for Twentsomethings, that I wrote 20 years ago when I actually was a twentysomething… (You see, before Millinials were cool there were X’ers) I said, yep. that’s me. We met briefly and he shared with me that he read my book during his freshman year in college and that it was an important read for him in helping him get his first job. To me, that was just unbelievably cool, especially in light that it seems that David has done pretty well for himself. Thanks David. Goes to show that whether you’re finding the people, sharing information with them, or getting them a job… what we do matters and sometimes without knowing it, we influence someone’s life by influencing their career. So you’re stuck, I’m in. I’m sold. I’m a believer and will see you at future events and strongly encourage anyone who missed it to hop on board and get to Orlando in the Spring. Bradley Richardson is a best-selling author and veteran executive recruiter. Over the last decade, Bradley has placed thousands of people with leading healthcare organizations and companies and counseled and created custom sourcing and recruiting programs for Fortune and Inc. 500 Companies and more. He and his work have been featured Fox News, GMA, NPR, Fast Company, Entrepreneur Magazine, and The Wall Street Journal. He is CEO of OSP Advisory, a turnkey sourcing and pipeline service based in Dallas, Texas. To learn more, sign up for his updates, or reach out to Bradley, visit www.bradleyrichardson.com . You can contact him at bradley@bradleyrichardson.com or bradley@ospadvisory.com.